Well, what an awesome and exciting three weeks it's been! 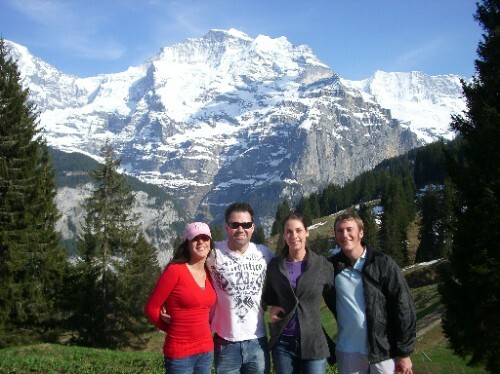 Seeing more of Zurich, Catching up with Donna's big sis Nikki and her hubbie Dean in Interlaken during their 'round the world honeymoon odyssey, and starting work have been the major highlights. Last week saw us spending more time working out the lay of the land in Zurich, finding a few good stores for electronics and electrical goods, and suffering triple coronaries when we decided to purchase beef steaks at the princely sum of 64 francs (roughly $65) per kilo! I almost died when I saw that our purchase of two beef steaks and two pork steaks [at the relatively "cheap" price of 45 francs a kilo! ;)] cost us 40 francs! Last week also saw us catch up with Ralph and Sandra, friends of Glenys and Henry (from Singapore, see our first blog entry), on Friday night. They are a really lovely couple, and were kind enough to impart much good advice and have continued to help us so much since we met them.Just like G & H, they have helped to make this move just that bit easier. When Saturday the 10th came around we were off to Interlaken for our first holiday within a holiday, which was very affordable because the Swiss have this great "Half-Fare Card" concept, where you pay 150 francs for a pass that lasts a year, and entitles you to 50% off ALL train, bus, tram and ferry travel within Switzerland, and 25% off the travel to Germany and Austria too! Anyway, we were going there to see one of Donna's favourite places in Europe, and to catch up with Nikki and Dean on their trek around the world. The scenery on the way there was just amazing, with lakes bordered by green hills and snow-capped mountains (see our latest gallery). We spent our first hour or so in Interlaken having lunch in the local Hooters restaurant waiting for Nikki and Dean's train to arrive, simply because it had the cheapest food available [and secretly, I think Donna liked showing the waitresses that she was more suitable for their job than they were ;)]. Anyway, N & D arrived around 1pm - you should have seen the huge grin on Donna's face - and then we set about heading to our hotel, Gasthof Schönegg, which is situated in Goldswil, a little town/suburb perched on a hill just above Interlaken. The view from the balcony was amazing, with the Interlaken valley in the foreground and towering mountains in the background. The Gasthof was a cosy little place, nothing too fancy, but very comfortable. We loved the cute red and white checked pillow cases and doonas (yes, being a guy I am still entitled to appreciate manchester), and the included breaky was great too, not because the food was out of this world, but because it was wholesome and you had the opportunity to eat while enjoying the spectacular view from the balcony. So anyway, on the afternoon of day 1 of our Interlaken adventure, the four of us headed up to Mürren, a little town about halfway up the mountains. The trip involved a train ride, followed by a cable car ride, followed by a cog-railway train ride to our destination. The views as we climbed were absolutely spectacular, as I think our photos in the gallery show. It was here that I had my first ever introduction to snow, although it was more like thick hail at that level on the mountain. We spent the first half hour or so in Mürren freezing our hands while making snow/hail balls, then had a bit of a walk around, which was eerily quiet as the whole place was pretty much shut down - not exactly the buzzing ski resort town we were expecting, but then it really is off season now. Quiet or not, we were treated to some more amazing views on our walk, which I hope our photos do justice. That night we headed to the Schuh (yes, it's the German word for Shoe!) restaurant where we had a lovely fondue dinner, involving three fondues. First a cheese, then a meat, then a chocolate. Now I hear you ask, what is a meat fondue? Well it involves a pot of close to boiling oil, and three types of raw meat which we had to cook ourselves in the oil. Needless to say, this was by far the longest course of the meal (2 hours!)! But it was worth wait!! We then headed back to our hotel, paying the princely sum of 14 francs for a trip lasting approximately 2 kilometres!!!!!!!!!!!! Day 2 saw us make our way up to Jungfraujoch - "Top of Europe", the highest point you can reach by train in the mountains around Interlaken. Jungfraujoch sits at about 3500m, about 500-1000m below the top of the Jungfrau mountain, and is effectively a large building housing an ice palace (easily the coldest indoor place I have ever been), the Sphinx lookout (the highest point of Jungfraujoch), 5 restaurants, and various outdoor snow activities (provided you're willing to walk the 45 minutes from the building to the outdoor activity area, which we didn't have time to do). Other than how amazing it all was up there, the biggest impact on us was how cold it was! None of us had ever been that cold in our lives! Sure, in the building it was toasty warm, but out at the two lookouts, when the wind started to blow, it was FREEZING! And of course, we were all intelligent enough to pick up snow to throw at each other, which then left us with frostbitten fingers for the next hour! On Monday we said goodbye to Nikki and Dean, as I had to get back to Zurich to prepare for my first day of work at MAN Turbo on Tuesday. Two weeks on, I am having a great time at MT. Sure, I haven't done any real work yet, because, let's be honest, I wouldn't even trust me to sell compressors yet, but I'm learning heaps and the people are great - everybody wants to help me out, pass on advice and are all incredibly friendly. It's the kind of company I think I'm really going to enjoy working for. Well, that seems about enough for the moment, we'll write again soon.